Have you seen Inside Out yet? We saw it as a family on opening weekend and absolutely loved it. I may have (silently) shed a tear or two. Riley, the main (human) character, is eleven years old, and is struggling with new emotions after a move to San Francisco. I have a ten year old daughter who is also struggling with some very tough emotions. Seeing Riley struggle brought all those mommy feelings of worry and fear come out strongly as I thought of my daughter. 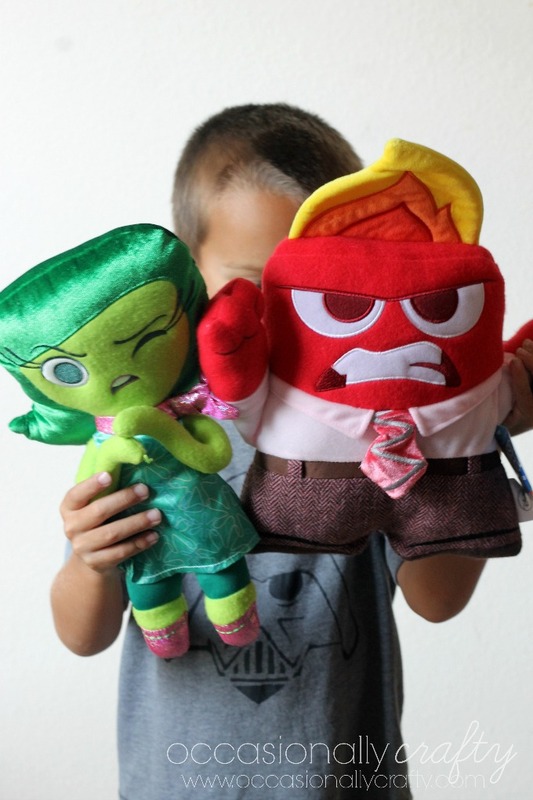 I'm thankful that we have an open dialogue between us where we can talk about feelings and how to handle them, and Inside Out gave me a new tool to use with all my kids! 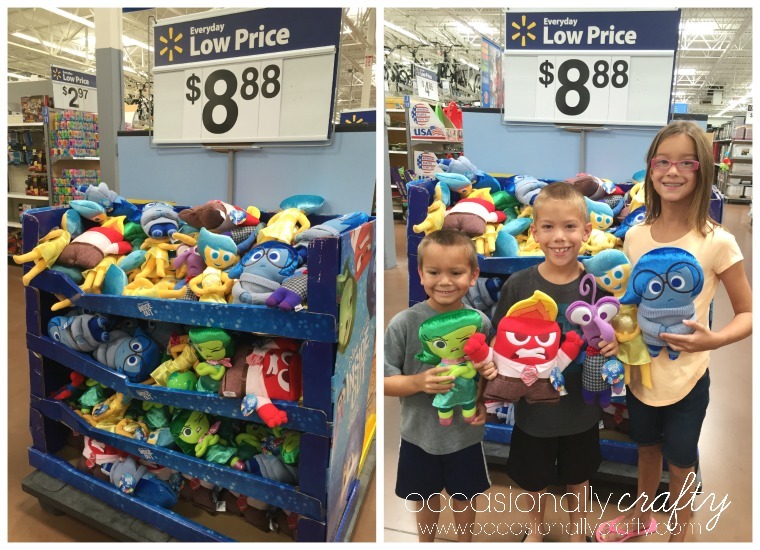 A few days later, we were shopping at Walmart (which is not exactly fun with three kids), when we spotted the brand new, exclusive Inside Out plushes. I practically had to hold my kids back to keep them from diving headfirst into the bin! They each picked out their favorite and started re-enacting the movie! My daughter grabbed Joy and Sadness. My youngest son grabbed Disgust. And my middle child, always the diplomat, grabbed Anger and said "someone needs to hold Fear, too", and picked him up. 1. Trace out where you want your stage opening to be. I wanted to make sure the plush characters would mostly fit into the window, so I used Fear as my guide. Lightly trace your lines with a ruler and pencil. 2. Paint your scenery on the display board. 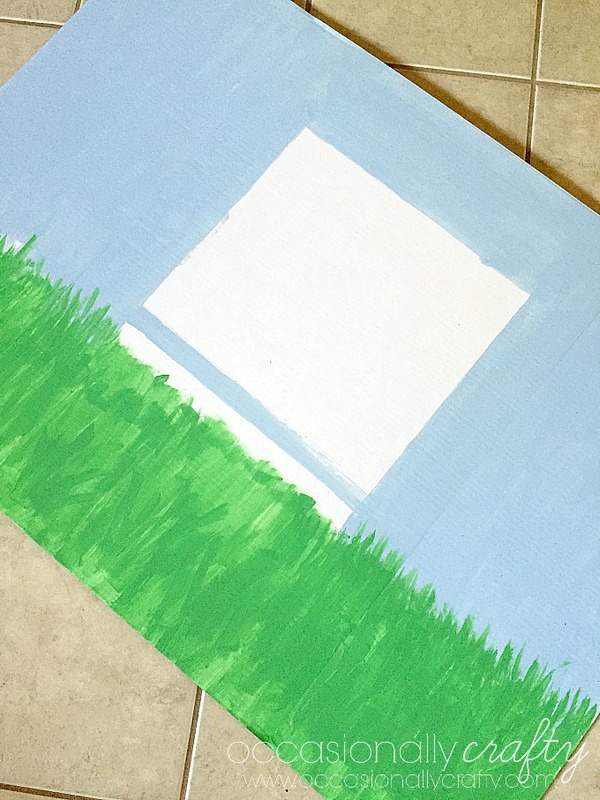 I wanted my kids to be able to use this for any "show", so we kept it simple- a sky and a field of grass and flowers. Poster paints would be perfect for this, but I just used some watered down craft/acrylic paint. 4. Use a box cutter to cut out your stage window. I place a ruler over the lines I had measured, then cut as I pushed the box cutter against the ruler to help keep it straight. 3. Add embellishments as desired. My daughter chose glitter flowers to represent the Inside Out characters. 4. Make a curtain. We kept this as simple as possible. Cut a length of fabric (I used burlap) to go from the top of the board to about 2 inches past the bottom of your stage window, and about 2 inches wider on each side. 5. Fasten your fabric at the top with large brads or other fasteners. 6. 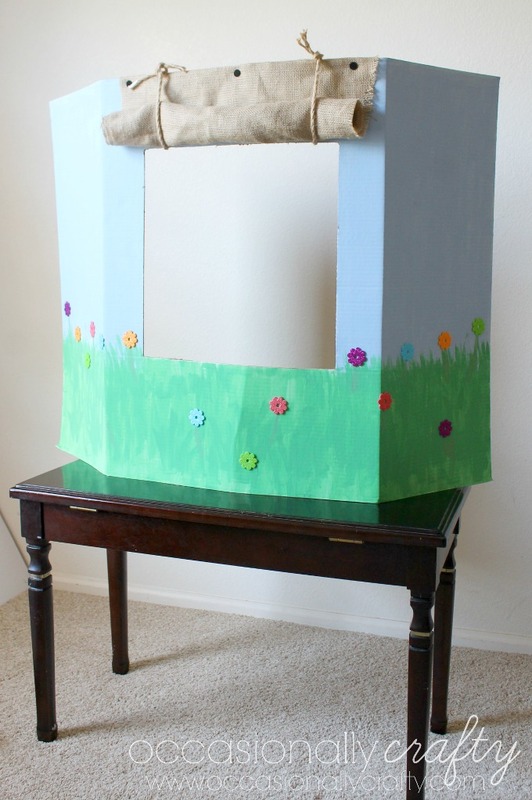 Roll up your curtain and tie with jute or twine pieces, fastening through the top of your stage window. This will keep the curtain out of the way for a long afternoon of play. The kids jumped right behind this and started playing. 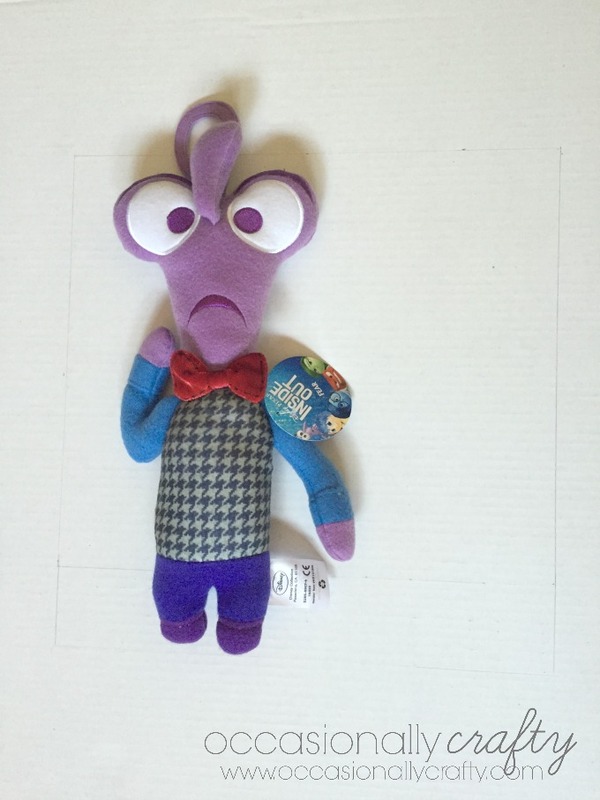 Note- we did not make the plush into puppets- we just let them be the characters on the "stage". They loved re-enacting scenes from the movie. Once that wore off, we started role-playing some different situations. They would sit behind the "stage" and I would go through a scenario with them. "You are playing a video game. You're in the middle of a level that you've spent a lot of time on. Mom tells you that you have to turn it off and go to bed. Which emotion are you feeling?" - My son would pull up Anger and re-enact his histrionics from the movie, and we'd all laugh. "Good- it's okay to feel angry, but what would happen if you acted like that to me? " "I'd probably get in trouble for being disrespectful," he said. "That's right. So you can feel angry, but you still need to show respect to your parents. What should you do instead?" " I could say 'Mom, if I quit now I'll lose my progress- can I please play until I hit a save point?'" "That's a much better idea!" That's just one example of how you can use these plush to help you talk about emotions with your kids. I have several very spirited children and one thing I have learned over the years is that it is SO important to be able to put feelings into words. It helps me be a better parent when I can understand what they are feeling, and it helps them to control their reactions better when they can understand some reasons behind why they are acting the way they are. My daughter is at that pre-pubescent stage where emotions are running all over the place. I'm glad that we can sit down and talk through the emotions and some reasons behind them. Knowing her emotions are "normal" helps her bring up her self-esteem, where otherwise she thinks there is something "wrong" with her. "Puppet" shows are a great insight to see what your children find funny, tidbits of knowledge they have that you didn't realize they knew, and otherwise develop physical skills as well as emotional and language skills. 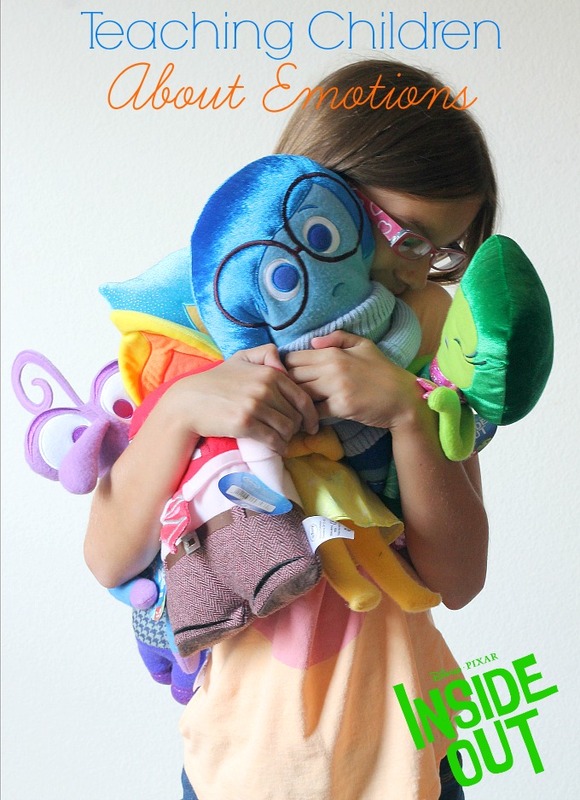 What was your favorite part of Inside Out? Or, if you haven't seen it yet, do you plan to?